Following on from the Daddy Umbrella, I found myself with extra umbrellas just waiting for someone to decorate them. In the meantime, M and I are doing a project on trees so I thought we should attempt a craft involving leaves. 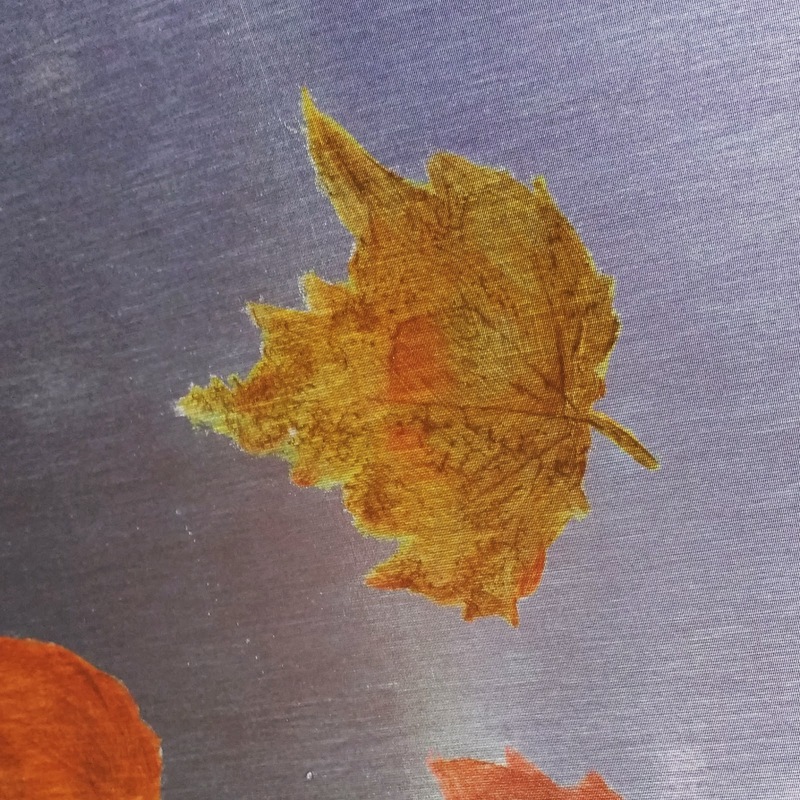 Painting by taking prints from leaves or bits of plants is something we've done before and it can be very effective. I found myself wondering if I could print onto an umbrella using leaves. Lessons learned from the Daddy Umbrella told me that acrylic paint mixed with fabric medium becomes transparent. Multiple layers help, but the umbrella fabric colour is still visible through the paint. 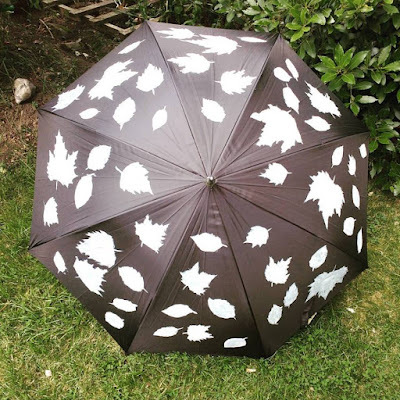 This is fine with pale fabric, but a strong colour like black (as on the umbrella I had available to take paint) would mean most colours are likely to be muted and difficult to see. 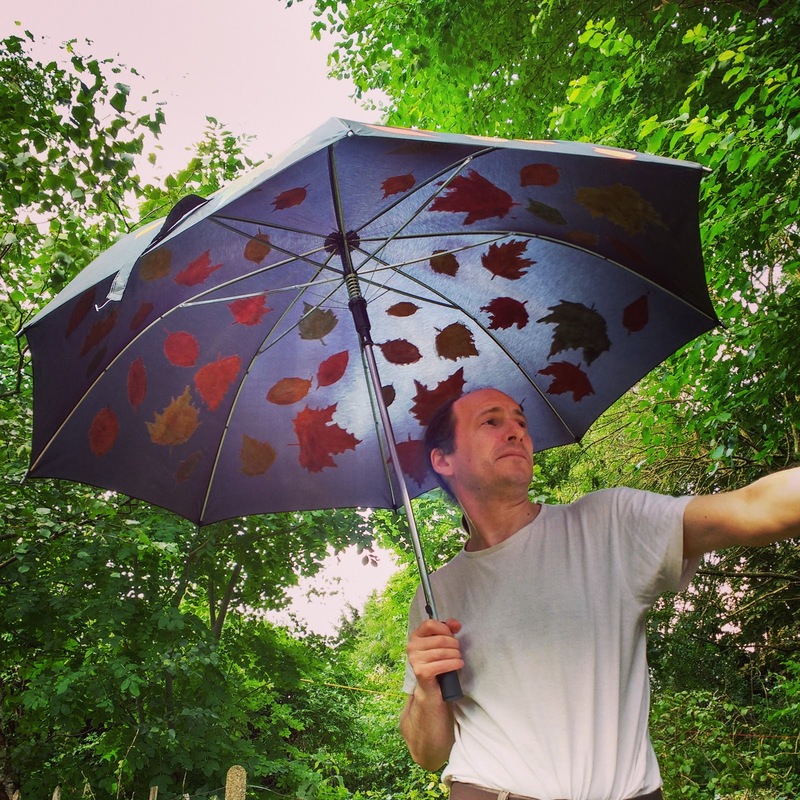 Personally, if I'm going to put in the effort to hand paint an umbrella, I want it to have a bit of visual punch and to stand out from a distance. One way to overcome this is to lay down a base colour, a foundation onto which you then paint the rest of your masterpiece. I had my plan. I decided we'd try taking prints in white paint, then fill in the resulting shape to give a white silhouette. Once this was dry, we could paint over the top in autumnal colours to hopefully give the effect of an umbrella covered in fallen leaves. I explained the plan to M who may have been doubtful, but loves me and so went along with the idea. Last weekend, we collected a few leaves while out on our cycle around the park, then got to work. M loved painting the leaves white, even if she didn't like having white fingers and kept running off to wash her hands. Together we applied leaf prints, taking a few prints before stopping to paint over the top. I went around the edges, neatening the leaves up and making them more 'leaf shaped' where either the print or M's painting ability had failed a little. Leaf prints, painted over to give white silhouettes. It was actually very striking and M was so excited, she ran around the garden a few times whooping. When you're a six year old artist, you get to do that sort of thing. I just oohed and ahhed, and was quietly impressed. The umbrella went into the shed to dry for two days, then we started on the next stage. We added colour. We worked with a limited palette of green, orange, yellow and red. The brief was to think autumn leaves as they fall from trees, but to only paint over the white. M finds paint difficult to work with, or rather she finds it harder to achieve the results she wants with paint, so this was a bit of a challenge. We talked about holding the brush as she would a pencil, not overloading with paint and steadying the umbrella with your spare hand. I was also ready with a clean finger to remove any excess paint before it had a chance to set into the fabric. 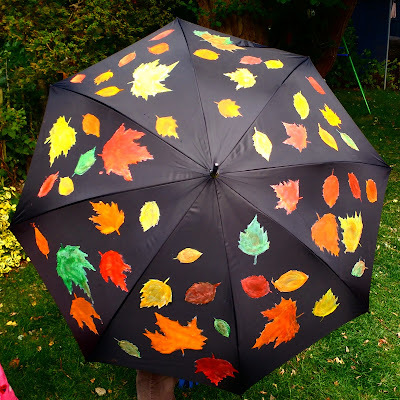 As it was, M painted a whole panel herself plus a few leaves scattered around the umbrella. I painted the rest. It took probably another two hours. M signed the umbrella using a bronze Sharpie and I dated it, then it went back into the shed to dry. Three days later, I ironed it using a hot iron and pressing cloth, before revealing the final result to M.
We were both impressed. I think the brushwork could do with a bit of practice in terms of technique, but the colours are beautiful. A water proof test followed, with both of us using a watering can to simulate rain. The umbrella was of course very good at repelling water, but what we were interested in was is the paint going to run. Fortunately, the paint stayed where it was so all our hard work was not in vain. Dave got in on the act, holding the umbrella while I tried to get a better angle as well as showing off the view from underneath. The view from the underside. 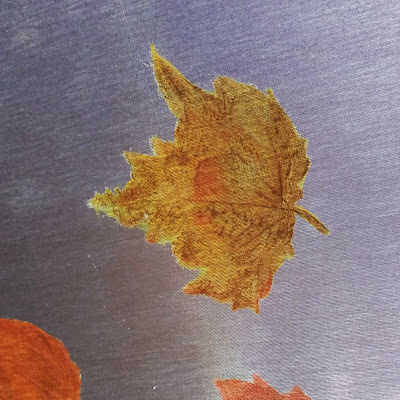 Looking closely, the original print of each leaf is still visible on the underside, giving a new dimension to the piece. 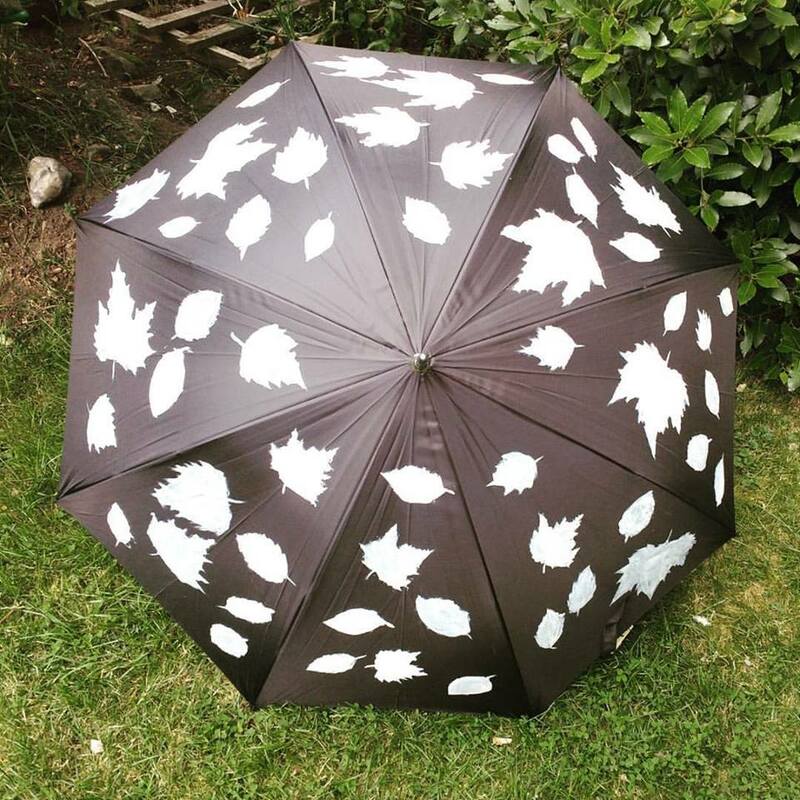 The veins of the original leaf prints are still visible from under the umbrella. Suffice it to say, I think this was a successful experiment. The resulting umbrella is eye catching, autumnal and colourful. Considering one of the artists was six, I think we did a good job.